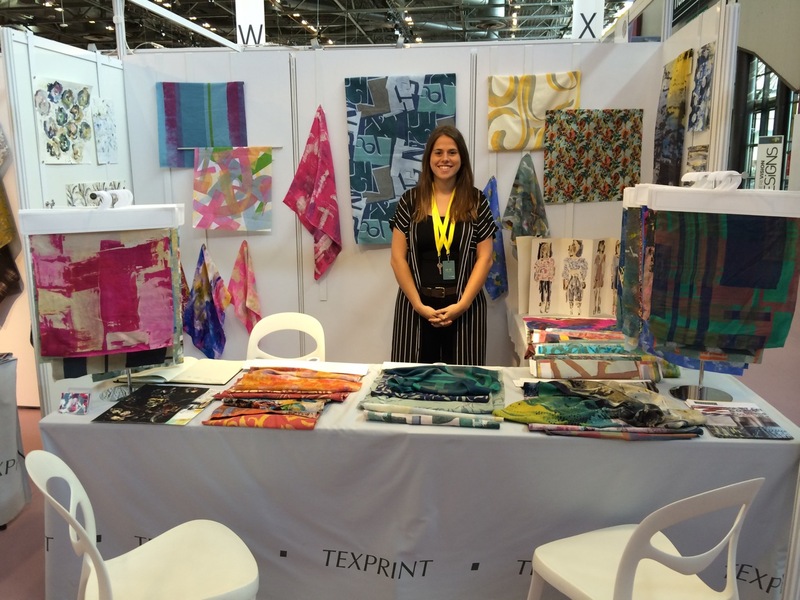 Sarah Cheyne, Senior Teaching Fellow in Printed Textiles was at Premiere Vision, Paris last week researching for an upcoming Live Project for our students as well as working with Texprint, an organisation that takes 24 of the best UK graduates to Paris to show their work to an international market. Amongst the 2016 Texprint cohort was Melissa Ougham, recent graduate from Printed Textiles at WSA. Here she is on her stand, showcasing her work. She will be starting her internship in Como, Italy in just a few weeks. This entry was posted in Textiles and tagged Graduate Showcase, Melissa Ougham, Printed Textiles, Texprint 2016, Textile Design, Winchester School of Art by Caitlin Hinshelwood. Bookmark the permalink.